Elsewhere on this website, we talk about the importance of forcing defendants to provide meaningful answers to interrogatories and other discovery requests. If we do not hold defendants' feet to the fire, we are throwing away a powerful tool to box in defendants for trial -- and providing evidence that we are not giving the case the care and attention it deserves. But this is an adversarial process. There are times when you should not have to give complete answers to an interrogatory because the question is objectionable. Practically, discovery objections also allow you to avoid answering difficult questions. Under Maryland law, this onus is on the party receiving the objection to force the issue. Just like you can take advantage of lazy or distracted lawyers by forcing answers to your interrogatories, you can also gain an advantage by not answering interrogatories that are arguably objectionable. The filing of timely discovery objections defers the requirement to answer the question until the defendant objects to your objections. You need to be clear in your objections or risk waving them. Federal Rule 33(b)(4) emphasizes that the "grounds for objecting to an interrogatory must be stated with specificity. Any ground not stated in a timely objection is waived unless the court, for good cause, excuses the failure." Generally, interrogatories are objectionable if they seek information that is not within the scope of discovery as defined in Maryland Rule 402 or Federal Rule 26(b). These are typically requests that are not relevant, unduly burdensome, broad, vague, privileged or protected by work product. Sample interrogatories in all types of personal injury, medical malpractice, and wrongful death cases. Sometimes, it is hard to come up with the exact words of why you want to object or to match the feeling that the request is objectionable with the appropriate law. So here are some sample interrogatory objections that might help you. Plaintiff objects to this interrogatory as vague, ambiguous, overbroad, and unduly burdensome. Plaintiff object to this interrogatory because it calls for the plaintiff to make a legal conclusion. Plaintiff object objects because this interrogatory calls for pure conjecture and speculation. It is not the job of the plaintiff to guess what would have happened in an alternative universe. Plaintiff object to this interrogatory on the grounds that this interrogatory is so broad, uncertain, and unintelligible that plaintiff cannot determine the nature of the information sought. Therefore, the plaintiff cannot provide an answer. Plaintiff objects to this interrogatory on the grounds that this interrogatory calls for information which is privileged within the attorney-client privilege and that it seeks information which is in the attorney's work product. Plaintiff objects to this interrogatory on the grounds that it seeks information in the possession of, known to, or otherwise equally available to the plaintiff. Plaintiff objects to the entirety of this request because it is not reasonably calculated to lead to admissible evidence. Instead, it was filed for the purpose of harassing, oppressing, embarrassing and annoying woman who everyone agrees is a victim but seeking discovery of matters that have zero relevance to this lawsuit. Plaintiff objects to this interrogatory because it seeks information from third parties and information not within its possession, custody, control, or personal knowledge. 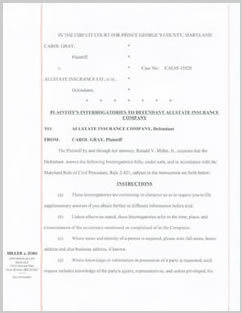 Plaintiff objects to this interrogatory because it requires the responding party to marshal all of its available proof or the proof the party intends to offer at trial. Plaintiff objects to this interrogatory because the only possible purpose of this request is to harass and to cause hardship to the plaintiff and needlessly increase of the cost of litigation to the plaintiff or her counsel. Plaintiff objects to this interrogatory in that it requests information that will not be known until after additional discovery is completed. Plaintiff objects to this interrogatory because the defendant had exceeded the number of interrogatories allowed by under Maryland law. Plaintiff objects because this request calls for the disclosure of attorney work product prepared in anticipation of litigation or for trial. Moreover, the defendant has failed to demonstrate a substantial need and the substantial equivalent of which the defendant would be unable to obtain by other means without due hardship. Food Lion v. McNeill, 904 A.2d 464, 393 Md. 715 (2006). This case is the seminal case in Maryland for the rule that there is no sandbagging in discovery. Food Lion was a worker's compensation case where the employer tried to challenge the plaintiff's expert witness disclosures because they failed to provide disclosures required under the rules. It clearly was a discovery violation but the defendant waived the right to seek relief because it waited until trial to raise the issue. Shenk v. Berger, 1991, 587 A.2d 551, 86 Md.App. 498 (1991). This is a little point to objections to interrogatories. But if are a plaintiff's lawyer, it is critical that you know this rule. If the defendant has surveillance films or Facebook posts of your client and wants to use them as evidence, they must be disclosed AFTER the plaintiff's deposition. So asking a question that covers this will not protect your client from getting blindsided with this impeachment evidence at a deposition. Kelch v. Mass Transit Administration, 411 A.2d 449, 287 Md. 223 (1980). The court found in this bus-motorcycle crash that you demand discovery, the other side must tell you when objecting whether they have the document (or tangible thing) being sought.